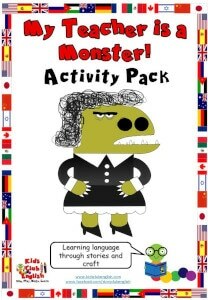 The My Teacher is a Monster Activity Pack is crammed with differentiated worksheets and craft activities to complement My Teacher is a Monster by Peter Brown. Perfect revision and practice of colours, numbers, school objects and body vocabulary while developing fine motor skills, literacy skills, social skills and useful language for the classroom. SEE PREVIEW FOR CLOSE-UPS OF COMPLETE CONTENTS. Find body labelling sheets, draw and colour, ‘how many teeth?’ counting sheets, number jigsaws, school vocabulary plane crafts, school objects fortune teller, school graphing dice, draw and write templates, four sets of mini-cards. These activities are the perfect complement to the very entertaining book, My Teacher is a Monster BUT they also work well independently as part of a unit focused on colours, numbers, the body and/or school vocabulary. If you don’t have access to the story, you can find a good collection of storytelling videos and related songs on our My Teacher is a Monster Story resource page. * Body labelling worksheets – Follow the activity suggestions to revise and practise body vocabulary. Suggestions included for non-literate learners too. Option to use one of the templates as a fun colouring activity. * Draw and colour – Children use their creativity and practise body parts vocabulary to create their own version of the teacher monster. * How many teeth? 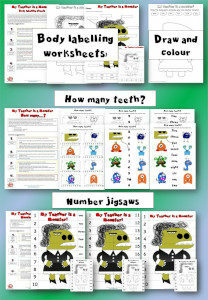 worksheets – Differentiate according to abilities in your group to practise numbers and counting with these fun monster worksheets. * Numbers jigsaws – Choose one of the three options in either a game or craft activity to make an attractive teacher monster jigsaw while practising numbers and sequencing at the same time. 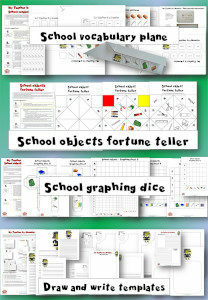 * School objects fortune teller – Using these templates, children create a fortune teller with common classroom objects. Follow the activity suggestions for fun follow-up games to play and practise. * School vocabulary plane – A fun way to practise school vocabulary using one of the interactive activity suggestions then play with the paper planes just like in the story! * School objects graphing dice and graphing templates – Using the variety of templates provided encourage children to practise their colouring, cutting and sticking skills. Once assembled, follow the activity suggestions to play fun games while practising the target language of your choosing. * Draw and write templates – a range of templates, with and without guidelines for kids to complete any related project. Also includes templates for kids to reflect and write / draw about themselves being monsters….and about their teachers too! 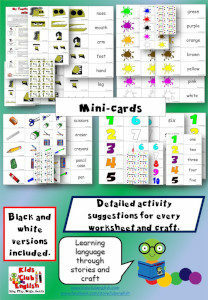 * Mini-cards – Excellent for a range of games and matching tasks. Print multiple sets for pair and small group work. The above images demonstrate what is provided in the My Teacher is a Monster Activity Pack. Download the preview for a closer look at the pack contents and to see the vocabulary items included:Download Preview The entire pack contains 103 pages of information and resource templates! Please note the My Teacher is a Monster story is not provided with this resource but you can find storytelling videos, as well as other related topic based songs on our My Teacher is a Monster Story resource page. Please note that parts of this resource require to be printed and self assembled. For best results Kids Club English recommends that you laminate mini-cards for improved durability. Laminating materials are not included.